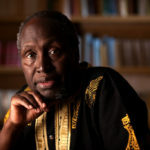 Born in Kamiriithu, Kenya, in 1938, Thiong’o is one of the most celebrated African intellectuals and writers. He has enjoyed international acclaim as a novelist, essayist, playwright, social commentator and activist. The experience of British colonialism and the Mau Mau struggle for independence, as well as Kenya’s position in the neocolonial era preoccupy much of Ngugi’s thought and writing. He established himself with a series of novels published in the 1960s: Weep Not, Child (1964), The River Between (1965) and A Grain of Wheat (1967). His combination of a distinctive prose style with provocative subject matter would come to define other works now considered canonical texts of African literature. These include Petals of Blood (1977), the play Ngaahika Ndeenda (I Will Marry When I Want) (1977) and Caitani Mutharabaini (1981), later translated into English as Devil on the Cross (1982). Volumes of essays and reflections, such as Decolonising the Mind (1986), Penpoints, Gunpoints and Dreams (1998), as well as his prison memoir, Detained (1981), have also been influential for generations of readers and scholars alike. In 2004, he published his leviathan Gikuyu-language novel, Murogi wa Kagogo, translated as Wizard of the Crow.